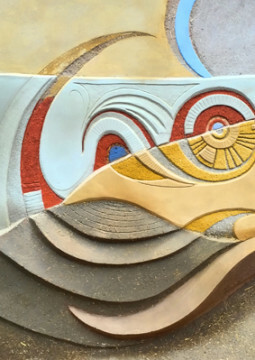 Carving and colours – amazing possibilities! 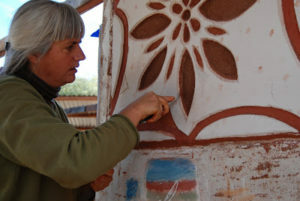 A six day In-Depth Clay Plaster Workshop with our guest teacher from Arizona, Athena Steen. 26 – 31 May 2017. Set on a beautiful estate of Michael Hall Steiner school in the East Sussex countryside in the village of Forest Row, UK. 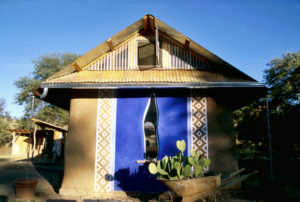 Taught in English by Athena Steen of the Canelo Project, author of many straw bale books, and architect and author Paulina Wojciechowska. 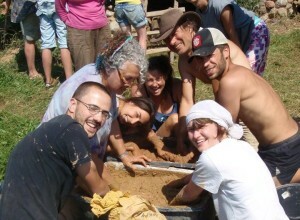 This workshop is a wonderful opportunity to gain hands-on experience of all aspects of clay plaster on a real straw bale that will be used for an outdoor classroom, in the woods of the school. The structure and straw bale walls of this building were built 2 years ago by class 9 students and a workshop that we ran and is waiting to be finished off with many layers of straw clay, smooth plastering and carving. The price of the six day In-depth Clay Plaster and artistry with clay plasters Workshop is £535 per person, or a discounted price of £485 is available if booked by 15th March 2017. The workshop will be lead by our guest teacher Athena Steen, along with Paulina Wojciechowska. Athena is considered one of the founders of the natural building revolution. In 1989, along with her husband Bill, she founded the Canelo Project, a non profit organisation with the aim of spreading their knowledge of natural building far and wide. Paulina gained her experience and wisdom in natural building while spending 6 months working with Athena and Bill, 20 years ago! Click here to read more about Athena and the Canelo Project. Paulina Wojciechowska, is a qualified architect who has 20 years of experience building with straw bales and earthbags in communities all around the world. 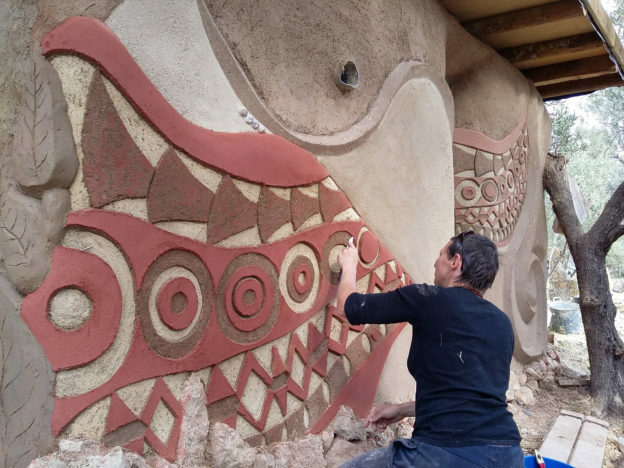 Paulina worked alongside leading straw bale and clay plaster veterans Bill and Athena Steen in 1997-8 and has been involved in running natural building workshops and designing and building structures with natural materials since then. Click here to hear Paulina talk about her experiences. Vegetarian food will be available at an additional cost, payable upon arrival. This is expected to be in the region of £10 per day. The food will comprise a self service breakfast, full cooked lunchtime meal, and a light supper. The workshop will be held on the grounds of Michael Hall School, in Forest Row on a large 6×10 metre straw bale structure built in previous years to be an outdoor classroom. You may camp within 20 minute walk by Weir Wood reservoir on a camping farm field or on a floor of a un used storage barn for £5/day, which includes the use of a kitchen, with toilet and shower facility. If you are camping, you are welcome to arrive any time from 15:00 on the day before the workshop starts and to depart the day after the workshop ends. Booking Multiple Workshops in UK. This entry was posted in Workshop on December 15, 2016 by Paulina Wojciechowska.